Open University A BSc for me! : FirstClass for Mac Users! Just thought I'd post something that I tried out just now and worked perfectly. Firstclass for MAC! Whilst booting into my windows XP partition on bootcamp today to log into first class I noticed on the splash screen the address for the firstclass website. Now I always thought that firstclass was an internal product of the Open University, but apparently not! If you go to this site "First Class Downloads" you can view the first class international clients. 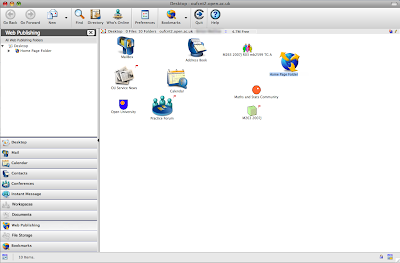 If you then go down to English UK you can see the windows and MacOSX versions. Click MacOSX you will be taken to a page to download the MACOSX universal binary of FirstClass version 9. Download it and install it. Once installation is complete you can launch the application and you will see this screen. You need to click Setup in the bottom right hand corner and you will be presented with this screen. 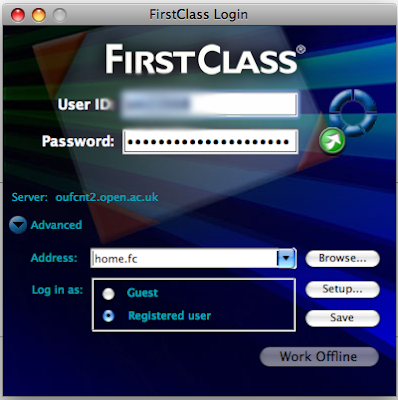 Fill in your OU server, which you will find on your windows version of Firstclass I believe it is either oufcnt1.open.ac.uk or oufcnt2.open.ac.uk so try either and see how you get on. 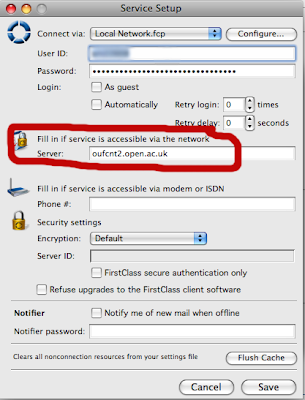 At the top fill in your student number and password as you would normally to log into first class or the open university website then click save. You will be back at the main screen. Click the green arrow next to the password field or hit enter on the keyboard. And Voila!! You have firstclass on your mac. See my desktop below. Cheers, saved me staring at the hideous web front end. Brilliant! I'd never have guessed it could be so straightforward. That's great thanks - saves me having to run ! @£$@%%*Windows :-) on a mac. I'm not getting this right - seem to have dowloaded and installed 3 times but can't access any. Help!! phew I was just about to give up! Thank you thank you!